Practice your multiplication with these cute mittens! Solve each math problem then color it and it’s answer the color indicated by the key. Cut them out, play matching games or use them as flash cards. 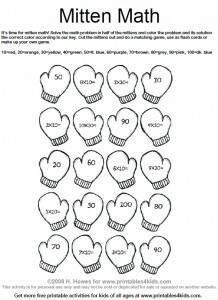 Click on the image above to view and print the math worksheet full size or download our Mitten Multiplication Math Worksheet as a PDF file.